The historic Post Office of Battle Creek, Michigan opened for business in 1907. It was designed by Albert Kahn. Albert Kahn was known as the man who built Detroit. Kahn designed over 2000 buildings; many of them were factories for Ford and General Motors. He used the same principles of factory design, using reinforced concrete in place of wood or masonry, for the post office as he did for his factories. The arches on the building are indicative of the second renaissance revival architecture. The Historic Post Office building was listed as a Michigan Historical Site in 1972. A marker is placed outside of the building commemorating this. The building was used as the Hall of Justice in the late 1970's. Currently, it is known as Commerce Point. A building used for commercial purposes. 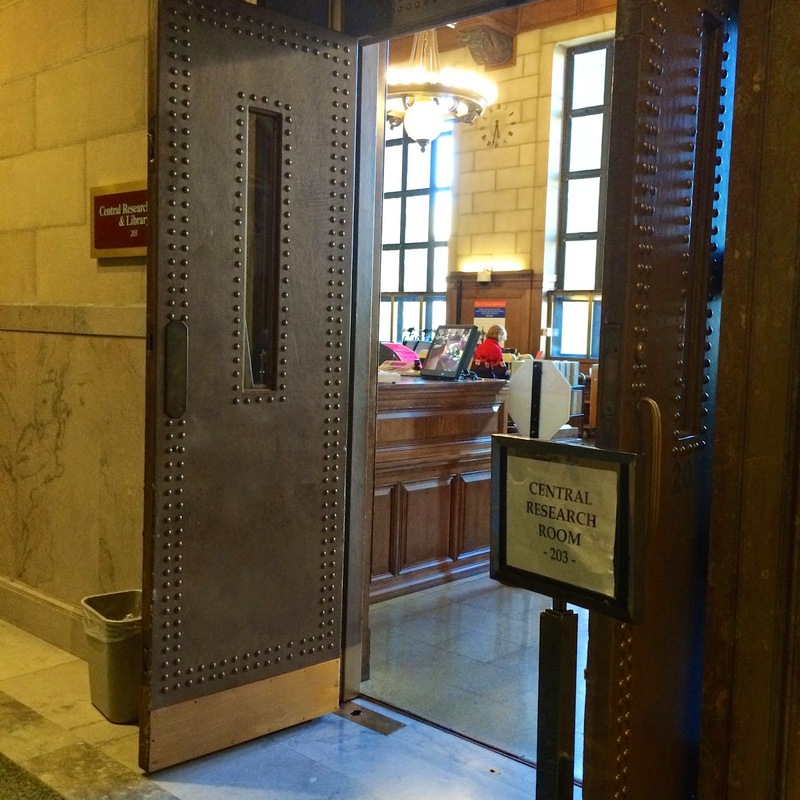 The Battle Creek Enquirer newspaper offices and Battle Creek Visitor Bureau are found here. Sarah Salisbury Glover was born 18 May 1827 in possibly Phelps or Oaks Corners, Ontario, New York to Charles Williamson Glover and Mary Ann Powers. She married Amos Criffin Blodget, circa 1852. They lived many of their married years together in Ypsilanti, Washtenaw, Michigan. Amos and Sarah Blodget moved to Nashville, Davidson, Tennessee prior to 1900. Sarah Salisbury Glover Blodget died 30 January 1910 of bronchial pneumonia in Nashville, Davidson, Tennessee. She is buried in the Blodget family plot with her husband, Amos, in Highland Cemetery, Ypsilanti, Washtenaw, Michigan. The obituary transcribed below was found in Huldah Rowley Fenn's Bible. It is for Tully Daniel Fenn, the brother of my great grandmother, Hattie Fenn Glover. Tully Daniel Fenn was born 26 February 1859 to Daniel C. Fenn and Elizabeth Poor Fenn. Where in the World is Vinera Eglantine Powers Glover? Vinera Eglantine Powers Glover has been one of the hardest ancestors to research. The census records during Vinera's life only listed the head of the household. The three censuses I have cited are for Vinera's husband, Samuel Stillman Glover. I included church records where Vinera Glover was listed by name to help place Vinera in a certain place at a certain time. I do not have primary sources for her birth and death dates. That is why I put the circa there. I believe I will have to rely on church records for this information. First, I need to determine where she was born. I have seen Vinera's name as Venera, Veneria Englantine and Veronica in my research. I have often wondered if there was any significance to her middle name "Eglantine" as it is an unusual name. This is the last page of Huldah's (Huldah Rowley Fenn 1789-1862) Bible that had information on it. Although most of the information was saved years after Huldah's death in 1862, I am still in awe of it being in the Fenn family today. The information transcribed below was written in Mary Louise Fenn Blades handwriting. Huldah Rowley Fenn was Mary Louise Fenn Blades 2nd great grandmother. Obituary. Horace A. Smith, who departed this life December 10, 1891, was born in Connecticut October 13, 1814, but the most of his boyhood days were spent in Plainfield, N.Y. At the age of twenty-one he came to Michigan and settled in Sylvan township. He was married to Martha Fenn July 12, 1836. After her death he was married to Helen Ellis April 3, 1856. He was the father of eight children, five of whom are still living. Mr. Smith experienced religion when a boy living in New York. On removing to Michigan he transferred his church relationship first to the Lima Congregational church. In 1851 he became a member of this church which at that time was known as the Sylvan Congregational church. He held the office of clerk of this church from January 1868 to January 1874. He was elected deacon in 1853, serving until March 4, 1871 and was again elected in 1874, and has held the office of deacon continuously since that time. Mabel: Mabel Fenn Darwin, daughter of Tully Daniel Fenn and Ella Mary Blake. Warren: Warren Orlo Fenn, great grandson of Huldah Rowley Fenn. Tully Daniel Fenn and Ella Mary Blake were Warren's parents. Elizabeth Huggett Fenn: Elizabeth was the wife of Warren Orlo Fenn. They were married 10 Aug 1916 in Convis Township, Calhoun, Michigan. The Fredricks side of my family has been having family reunions for as long as I can remember. One of the activities that has carried throughout the years is one of family photographs. Sometime during the day the family groups will get together and pictures will be taken. 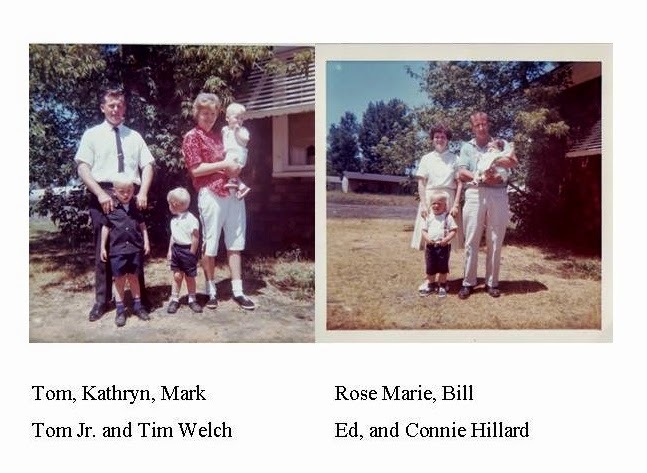 The pictures I am sharing below are from a family reunion held at my Aunt Kate's house in 1964. Kate, Kathryn Louise Fredricks, was one of eleven children born to Otto August Fredricks and Daisy Ellen Graf. The oldest son, Harold, was born to Daisy Graf before her marriage to Otto Fredricks and he took the Fredricks surname. He was considered a full brother by his siblings. 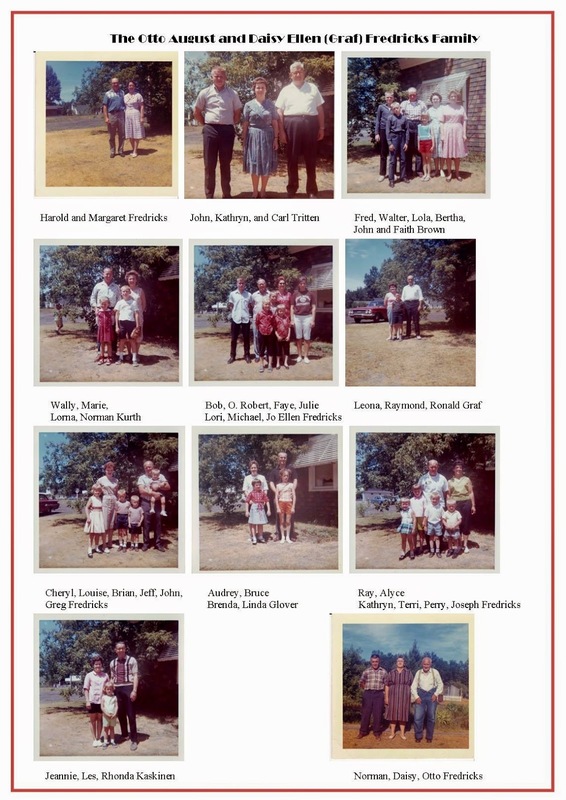 I believe all twelve siblings were in attendance at this reunion, but I am missing a picture of the Richard Fredericks family. These are my ten aunts and uncles and their children, my first cousins. Other cousins with families of their own were in attendance that day as well. Kathryn Marie Welch is the daughter of Carl and Kathryn Louise Tritten. Rose Marie Hillard is the daughter of Leo Sandberg and Daisy 'Marie' Fredricks Kurth. Last, we needed a picture of all of Otto and Daisy Fredricks grandchildren. The family was pretty complete at this reunion. The family members missing that day were Larry and Nancy Fredricks, children of Harold and Margaret Fredricks. Richard, Mickey, Pam, and Richie Fredericks, although Pam is the first one on the left in the back in the picture above, so I am guessing my Uncle Richard was camera shy that day. A very excellent turnout if you ask me. I didn't get to see my cousins very much when I was younger so I always looked forward to family reunions. It was a day to hang out with them. George B. Fenn is the son of Daniel C. Fenn and Elizabeth Ann Fenn, nee Poor. George B. Fenn is my great grand uncle. He is the brother of my great grandmother, Hattie Fenn Glover, who I have written about a lot. I found two marriage records for George B. Fenn. The first one he married Leona A. Parker, the daughter of Charles Parker and Martha Crumb Parker. Don't you love it when they record the parents names on marriage records? George and Leona were married the 26 Oct 1901 in Hersey Osceola, Michigan. They were married for ten years before Leona died the 22 March 1912 in Hersey, Osceola, Michigan. Next, there is a registration entry for Geo. B. Fenn and Etta L. Cline. The marriage date was recorded as 30 Sept 1914 in Grand Rapids, Michigan. If you look at the record above you will see that a line has been drawn through the record. I don't know the significance of this. I do know that the records on this page were mostly from Osceola county, Michigan. Grand Rapids is in Kent county, but I can find no record of their marriage in Kent county. For now I am using the Grand Rapids as the place of marriage. George Fenn is listed as married at the time of his death in 1935. 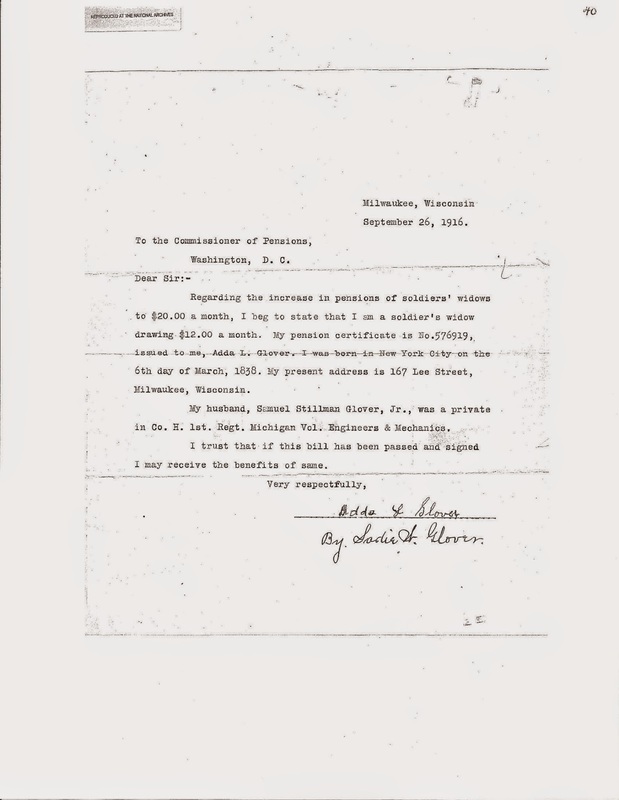 A deed shows George B and Etta Fenn sold their house in Hersey, Michigan to their daughter, Mary Brockett Fenn in 1936, one year after George died. Although the entry was crossed off, I do not believe it was crossed off because the marriage never happened. I enjoy the depth of information recorded on Michigan marriage records. If you have Michigan ancestry be sure to check the marriage records. 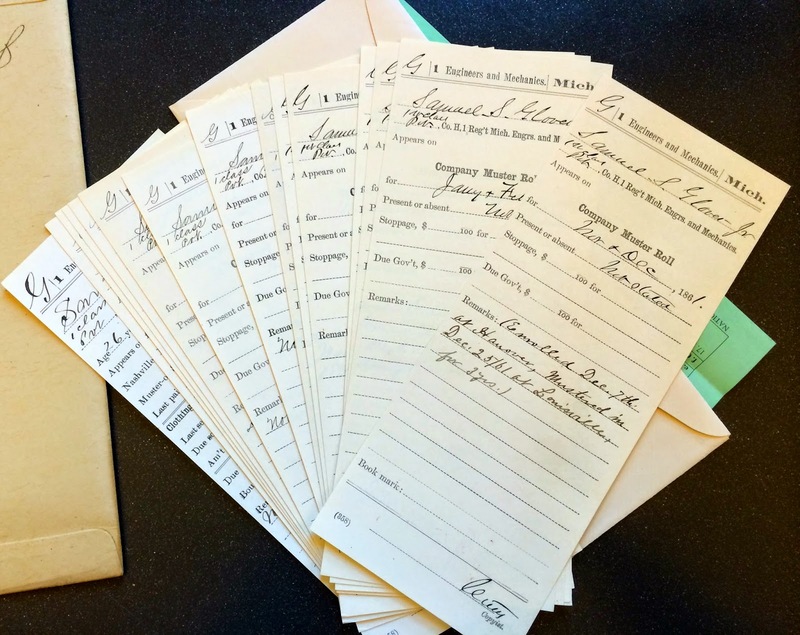 Finding an 1838 birth record for New York can be challenging when the earliest statewide registration began in 1847, so I needed to use other sources to verify Adeline Dyer's birth. The first mention of Adeline's birth date was found in her husband's, Samuel Stillman Glover, Jr., civil war pension file, which I wrote about here. Adeline Dyer Glover states that she was born on 6 March 1838 in New York City. Further research has determined that her parents were William G. Dyer and Mary Ann Swallow. I thought finding this information would satisfy me, but since it wasn't primary information I kept digging. William Dyer in entry for Adeline Dyer, "New York, Births and Christenings, 1640-1962"
One may look at this and wonder how I came to the conclusion that this was my Adeline Dyer. The birth year on the transcribed index is 1835, three years earlier than Adeline reported in the pension file with the baptism taking place seven years later. This information prompted me to look at the other records I have about Adeline. This is the only record that deviates from the 1838 date for birth. Her marriage record, all census records, family Bible record, and death record is consistent with a 1838 birth year. Since this is a transcription of an index, I need to look at the index myself and find the original record before I change her birth year to 1835. The only other explanation would be another child born to William and Mary Ann Dyer, named Adeline, who died before the second Adeline's birth. I have found no evidence of that occurring. I made note of the discrepancy in my Roots Magic software. Next, I decided to do a little research on the church listed in the index, Saint Mark's Church, New York, New York. St. Mark's-In-the-Bowery, 131 East 10th Street, is the official name of the church and has a rich history. It is New York City's oldest site of continuous worship and the second oldest public building in Manhattan. Petrus 'Peter' Stuyvesant, Governor of New Amsterdam, purchased the land the church is on, in 1651. He had built a family chapel on the land by 1660. Petrus' grandson, Petrus, sold the land to the Episcopal Church, in 1793, for one dollar. Governor Stuyvesant is buried beneath the church. 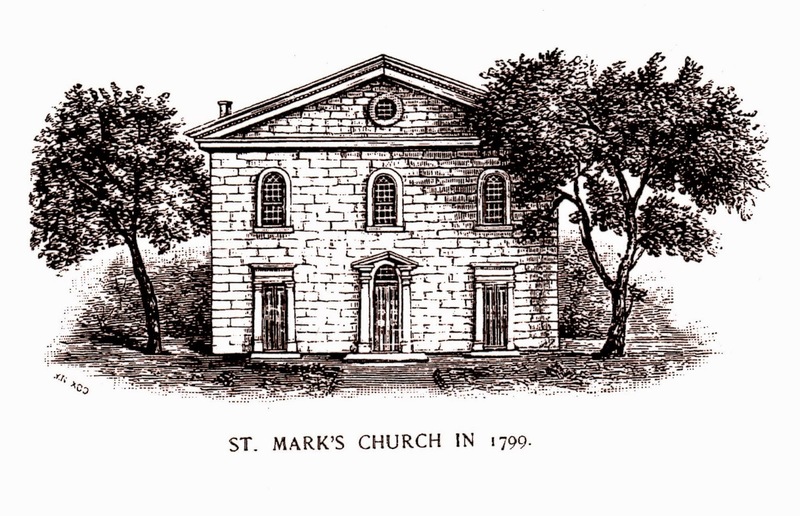 The building of St. Mark's-In-the-Bowery began with a cornerstone being laid in 1795. The fieldstone Georgian style church was completed in 1799. The church saw 200 summer worshipers and 70 winter ones by 1807. The steeple was erected in 1828, ten years before Adeline Dyer's birth. St. Mark's In-the-Bowery has its place in New York City history. It is a New York City landmark and part of the St. Mark's Historic District. It is listed on the National Register of Historic Places. It is located in what is now East Village. Although I still have to find the original records and analyze them, I feel confident that the Adeline Dyer who was baptised in St. Mark's-In-the-Bowery is my second great grandmother. Shoreham, Vermont is going to be the focus of my attention this month as I research my Fenn family. It is the last known place the Fenn's lived before migrating to Michigan in the spring of 1833. Daniel Fenn and his wife, Huldah Rowley traveled, via the Erie Canal, to make their home in the territory of Michigan. 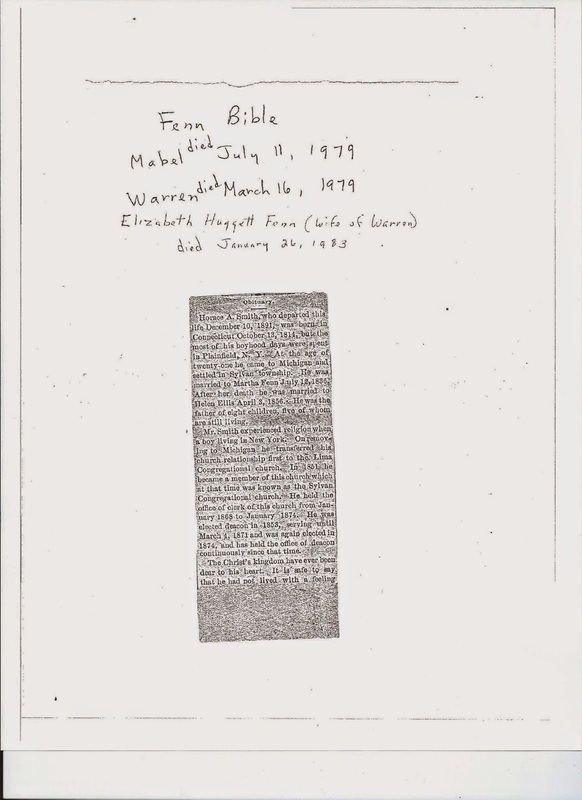 I have found records about Daniel and Huldah Fenn in Michigan, but cannot find much about their time before this. Daniel Fenn is one of my brick wall ancestors. A brick wall I am going to break through this year if at all possible. 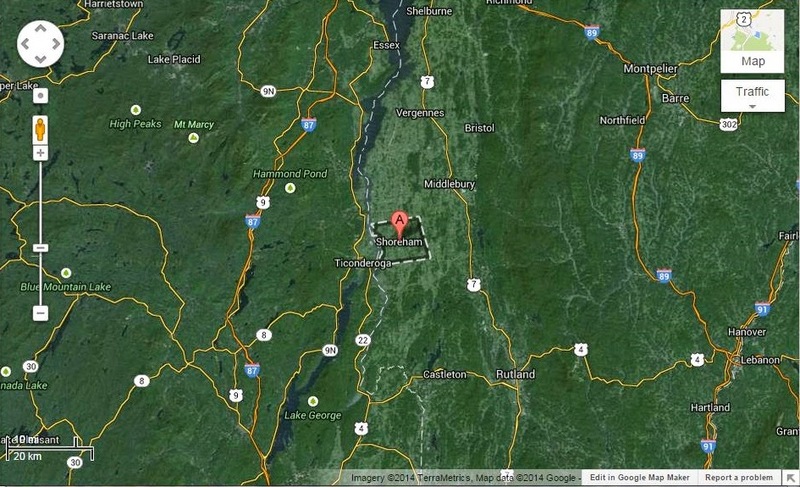 My first plan of attack is through Shoreham, Vermont! Shoreham was incorporated in 1761 by a New Hampshire Grant. The first settlement in Shoreham was in 1766. Shoreham is located on the east side of Lake Champlain, with Ticonderoga, New York just across the lake. Currently, it is located in Addison County, Vermont. Prior to 1785, it was Rutland County, Vermont. Daniel Fenn and his family lived in Shoreham for the 1820 and 1830 United States Census enumeration. The book, "Early Families of Shoreham" by Susan Holt MacIntire and Sandord Stowell Witherall states that "FENN, Daniel m. in Shoreham, Vt 28 Feb 1808, Hulda Rowley". This is the earliest mention of Daniel Fenn being in Shoreham, Vt that I have found. Daniel was about 21 years old at the time of his marriage. I haven't been able to find Daniel and Huldah in the 1810 Census. Could they be living with Huldah's father, Hopkins Rowley? Hopkin's census record has a male and female of the age Daniel (23) and Huldah (20) were, but without further proof I can't say for sure it is them. Ah! The joys of researching pre-1850. I haven't a clue who Daniel's father or mother was. What do you think my next research step should be? I have found a few resources in my research of Daniel Fenn and Shoreham,Vermont that I thought I would share with you. History of the Town of Shoreham Vermont by Josiah Goodhue. 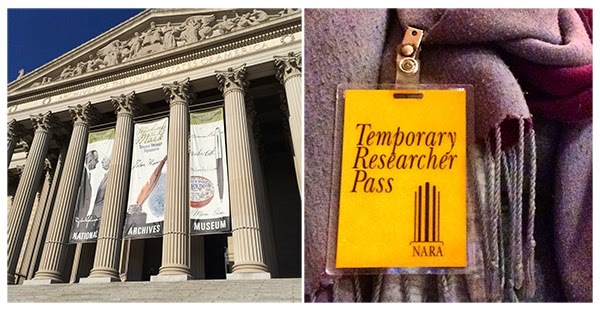 I know I need to have feet on the ground in Shoreham to further my research and a New England trip is a couple of years off, but I want to explore all resources available to me locally, either online or at local repositories. Any suggestions of resources or researchers in the area would be greatly appreciated as I try to find Daniel Fenn's parents. I am at the point in my research where I am trying to fill out what some call "in between the dashes"; the happenings in a person's life that goes between their birth and their death. Newspaper articles are a great way to flesh out an ancestor's story. The above newspaper article is one such find. It is an announcement of Annette Glover Youngs and Jesse Youngs' 62nd Wedding Anniversary in 1922. First, it is awesome that a couple has been married for 62 years, but just as awesome that both people were around 80 years of age when they did so. The above newspaper article is rich in genealogical treasures. I wish I had one for each of my ancestors. Although I don't know who wrote the article, I know it was published one month after their anniversary and the Youngs were still alive. Some of the information included in this article was Annette Glover's birth date, the family of Annette, her early years, the migration of the Youngs family, how Jesse and Annette met, where they married and by whom, their children and more. Annette Glover Youngs is my second great grand aunt. She is the daughter of Samuel Stillman Glover and Vinera Eglantine Powers, my third great grandparents. Annette Glover Youngs is the younger sister of Samuel Stillman Glover, Jr. A descendant of Annette, Peter, sent me a copy of this wonderful tribute to his ancestors. Peter has been very generous sharing his research with me and I am grateful for that. Annette Glover married Jesse Youngs on the 13 December 1860 in Canton Center, Michigan. Below is a transcription of the article. Photo Caption: MR. AND MRS. JESSE YOUNGS OF TUTTLE HILL. Tuttle Hill, Jan. 31.- Mr. and Mrs. Jesse Youngs of Tuttle Hill, who celebrated their sixty-second wedding anniversary Dec. 13, 1922, are the parents of 8 children, the grandparents of 40 grandchildren and the great-grandparents of 37 great-grandchildren. Mrs. Youngs, nee Glover, was the daughter of Samuel Stillman and Veneria Eglantine Glover of Howell. She was born March 17, 1844. When an infant her mother died, leaving a husband and a family of seven sons and six daughters. When Annette was five years old she came with her father to Ypsilanti township where she has ever since made her home. Jess Youngs, son John and Eve Youngs, was born on the farm, where he has always lived, March 24, 1841. He grew to manhood in a home where hospitality and neighborly helpfulness were the watchwords of the family. Settlers going through to the west with the few wordly (sic) possessions of the pioneer loaded in ox-drawn wagons, the women and children walking or riding by turns, often stopped with "Uncle John" and "Aunt Eve", as the parents of Jesse were known. These pioneers would remain for a night's or day's rest before resuming the long journey. Frequently those who came to settle in Michigan made the Youngs' home their stopping place while they looked for a new home. John Youngs and Hiram Tuttle, for whom Tuttle Hill was named, were among a party of five who came to make their homes here. The deed to the Youngs' famr reads, "The United States to John Youngs, June 8, 1833." Loyal Tuttle, a cousin of Hiram Tuttle, followed soon afterward. On Dec. 13, 1860, Jesse Youngs and Annette Glover, schoolmates at Tuttle school, drove to the home of Elder Isaac Cannon at Canton Center and were married. They established their home in the same spirit of helpfulness and hospitality as was manifested in the household of John and Eve Youngs. Nine children were born to this union. They were Jesse Edward, who died July 15, 1918, the first break in the family in 58 years of married life; Mrs. Ella Kelly of near Tuttle Hill, Charles of Madison, Wis., John of Ypsilanti, Eugene of Highland Park, Bert of Ypsilanti, Mrs. Eva Bunton of Highland Park, William of Ypsilanti, and Mrs. Louise Faragher of Loraine, O. For more that 40 years Mr. Youngs owned and operated a threshing machine. He is known to hundreds of farmers throughout Washtenaw county. When sickness or death or trouble of any nature came to a home in the vicinity Jesse Youngs and his wife were always among the first to call and offer their services. Many a person in financial straits has been welcomed to the table in the Youngs' home and invited to stay until things turned out right again. Said one of the sons to the writer: "There were not many days we sat down at the table with just ourselves present. Anyone coming by would be given a place in the family often for several days if in hard luck. During her lifetime Mrs. Youngs has cared for scores of babies and their mothers in the community. The first baby whose entrance into the world she assisted and whom she dressed was R. F. Walters of Willis, whose parents were at one time near neighbors of the Youngs. Mrs. Youngs was a cousin of the late H.P. Glover of Ypsilanti. George Grimstone of Ann Arbor and Mrs. Youngs are the last of a long list of cousins. Several years ago she fell and injured one of her legs severely, and has been trouble with its (sic) at times since. But her hospitable spirit is as strong as of old and she still delights to have a neighbor or friend come in for a chat over a cup of tea. At the sixty-second wedding anniversary of Mr. and Mrs. Youngs 80 guests were present, five of whom were more than 80 years old. Mrs. Rhoda Derbyshire, 87, was the eldest, the others being John Bunton of Arbor, Hiram Eaton of Ypsilanti, Mrs. Rachel Tuttle of Tuttle Hill and Mr. Youngs. Seven, D.C. Griffin and Mrs. Mariam Sanderson of Ypsilanti, Mrs. Hattie Prince of Waterloo, J.C. Tuttle, Mrs. J.C. Tuttle and Charles Newton, all of Tuttle Hill, and Mrs. Youngs, were more than 70 years old. Mr. Youngs, though nearly 82 years old, is still hale and vigorous. Among the chief delights of Mr. and Mrs. Youngs today are the visits they receive from their 37 great-grandchildren. A Teenage Mutant Ninja Turtle vehicle. It was a hit! January birthday parties are tough to plan in Michigan because you never know what the weather will be like. There were many 6th of January's when it snowed, making travel difficult. There were many times when one or more sets of grandparents were planning to come and celebrate Travis' birthday and couldn't because of the weather. This year, 1991, found Travis' paternal grandparents living in Florida. Travis' 4th birthday was one such year. Travis turned four with a quiet party at home with Dad, Mom, and Kirsten. I still made sure he had a great birthday. We celebrated in Teenage Mutant Ninja Turtle (TMNT) style. The wrapping paper, cake, and party accessories were all TMNT. A few of the gifts were turtle related, too. Travis loved all things turtle that year. He would play for hours with his turtles. I still have a big box of TMNT stuff saved for him. Travis blowing out his birthday candles. I wanted all their birthdays to be special and I would set the table with a tablecloth, good stoneware and even let them use my Fostoria Virginia Blue crystal goblets, pictured above. It was a treat for them. I learned a long time ago that I was not a cake decorator! Travis always liked his cake from the Felpausch grocery store, a local grocery store at the time. This one was decorated with one of the ninja turtles and four ninja turtle candles. One each for Michelangelo, Rafael, Donatello and Leonardo, the ninja turtle names. Birthday cake was served on TMNT plates with matching napkins. My tow-headed four year old was such a happy guy. I loved his energy and enthusiasm for everything. He had a smile on his face most of the time. The sticker in the picture above was given to him by his preschool teacher. Travis attended Woodlawn Preschool in Battle Creek, Michigan at the time. This was the age when Travis first showed an interest in Lego's. He wanted the castle Lego building blocks. Our whole family would sit down and put together the castle Lego building blocks. I have another box of Lego's waiting for my children to take them to a new home. Another gift that Travis got excited about was money as you can see from his expression above. A trip to Toys R Us was usually in order the day after his birthday. Nerf blast-a-matic toy pop gun was a big hit with Travis that year. This Nerf gun shot little yellow, rubber balls out. This would be one of many Nerf toys received throughout his childhood. It is a wonder that nothing every got broken with that toy. What boy doesn't like Dinosaurs? The sweatshirt above was given to Travis by his Grandma and Grandpa Leyndyke. The dinosaur on the sweatshirt was cross stitched on the shirt. He got a lot of wear out of this sweatshirt. Another favorite character that Travis enjoyed at this age was Waldo. Where's Waldo books would keep him occupied for hours. Travis received a Waldo sweatshirt, book, and puzzle as well for his fourth birthday. Celebrating birthdays as a family was a memorable part of Travis' childhood and his fourth birthday was one to remember. Cowabunga, Dude and Happy Birthday, Travis. Santa, aka my husband Kirk, knows me well and knows what will make me happy when it comes to gifts. He did not disappoint this year. 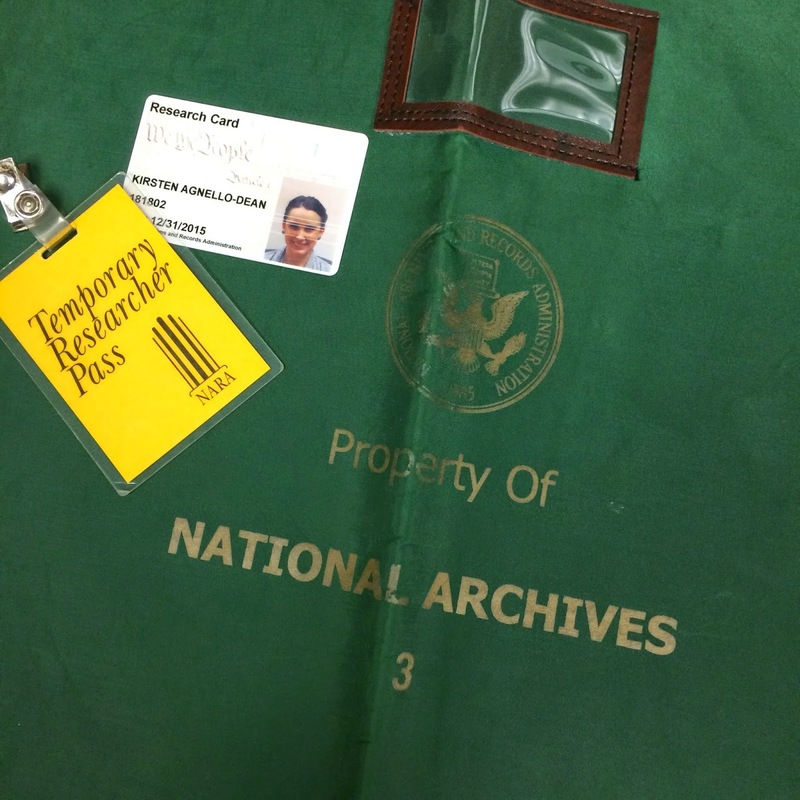 He gave me one of the Great Migration bundles from New England Historic Genealogical Society(NEHGS) as a gift. I could not have been happier. Anyone who has read my blog knows how much I love books. Books and Genealogy go together well in my opinion. The books I received are The Pilgrim Migration, The Great Migration Begins, 3 Volumes, and The Great Migration 7 Volumes. I have used these numerous times at the library, but to have my own set to refer to is heaven especially since the books at my local library are for reference use only and not available for check out. The book gift giving didn't stop there. My parents gave me The Planters of the Commonwealth by Charles Edward Banks and Our Daily Bread: German Village Life, 1500-1850 by Teva J. Scheer. Lastly, I treated myself to a book, The History and Antiquities of Every Town in Massachusetts by John Warner Barber. Elements of Genealogical Analysis by Robert Charles Anderson. Does anyone have this book? What do you think? I read one review and it made me think maybe I don't need it. The Great Migration Directory: Immigrants to New England, 1620-1640 A Concise Compendium by Robert Charles Anderson. This one is being published in 2015. I will wait and see about this as I don't know if it duplicates the information in my Great Migration books or not. 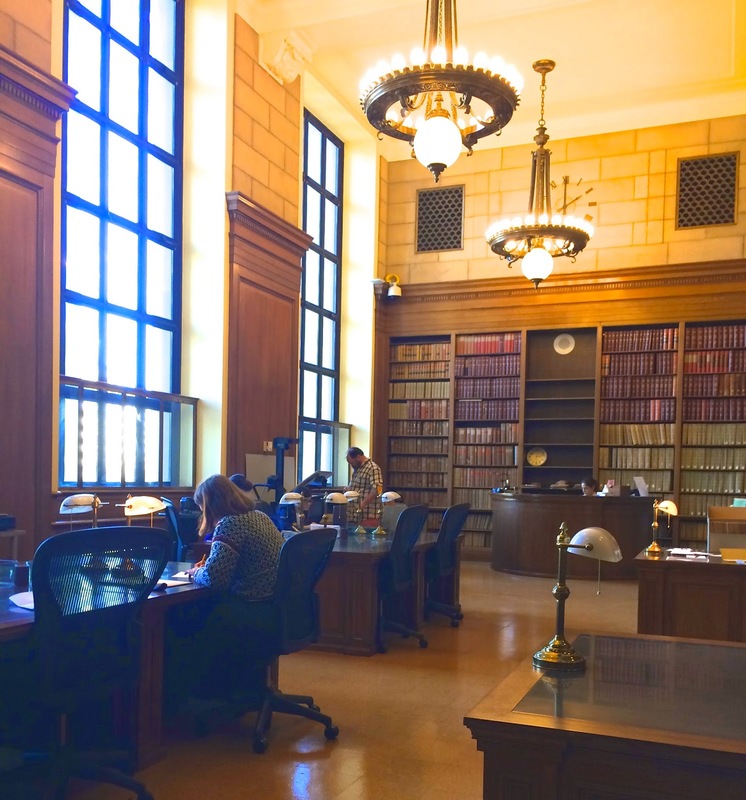 A Guide to Massachusetts Public Records: Parishes, Towns and Counties by Carroll D. Wright. This book will be used to help in my preparation for a future New England trip. Getting books for Christmas prompted me to clean my office and find a space for them. I decided not to put them on my bookshelf yet because I plan to spend most of my January looking through them and adding facts to my Roots Magic software. 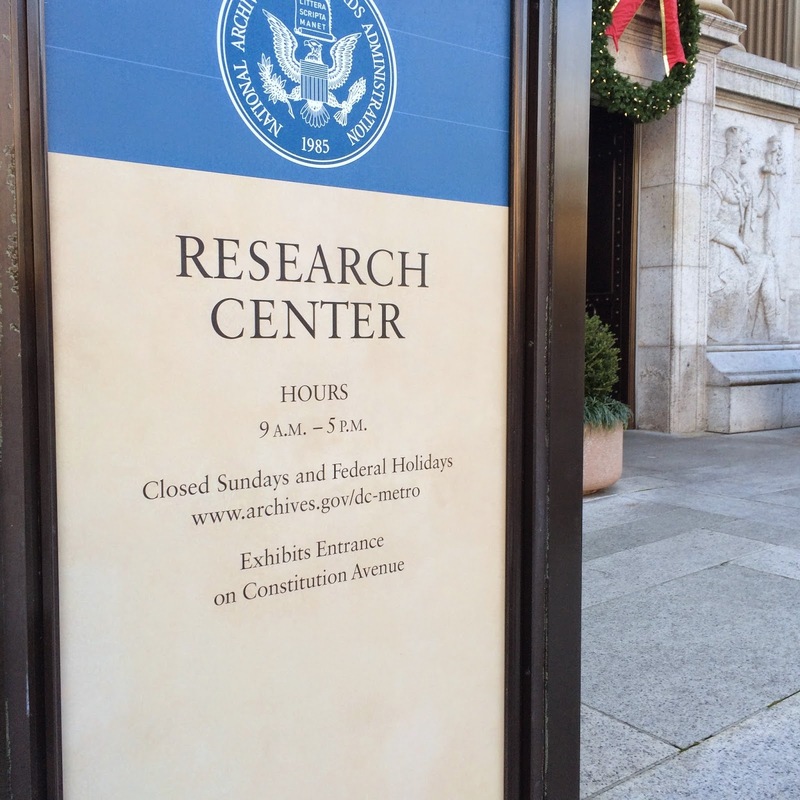 Did you get a genealogy related gift for the holidays? Please share in the comments section. If it is a book, I may need to add it to my wish list.